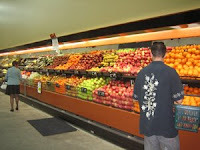 USA oranges are $3.99/kg, which is less than New Zealand oranges at $4.99/kg. 1 kg = 2.2 pounds. How does that carbon footprint calculation go again? Some writers from America refused to come here for "Readers and Writers" week, claiming the best thing anyone can do for the planet is not fly. That may be true but it doesn't apply to New Zealanders. 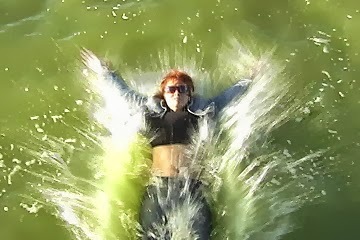 The Kiwis have to fly. 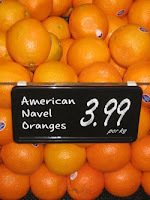 Sometimes the sign says "USA...oranges" Sometimes it says, "American..."
Why does everyone assume "American" always means USA. It doesn't!! More on this 'americanismizin in new zealand' in a new essay.....April 1 2008.